The word is out: Godzilla is awesome. This was something I was lucky enough to discover two weekends ago, just ahead of the film's junket. A few short hours after penning my five-stars review of the film, I had the opportunity to geek out about it with two of Godzilla's stars, English dreamboat Aaron Taylor-Johnson and Japanese icon Ken Watanabe. We teased a bit of these interviews last week, so Godzilla's co-stars could respond to the fat shaming that has been spurred by the iconic movie monster's latest makeover. 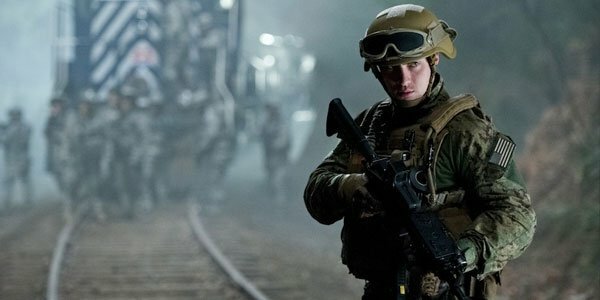 Now, we offer five other fascinating revelations learned from Aaron Taylor-Johnson and Ken Watanabe about the monster, the movie, and working with director Gareth Edwards. WARNING: Some spoilers for Godzilla lie ahead. Making the leap from the low-budgeted Monsters to the tent pole Godzilla, helmer Gareth Edwards prepared for production by creating a complete pre-visualization of the entire film with the help of his director of photography Seamus McGarvey and his editor Bob Ducsay. This helped them map out cuts, visual effects, and even plans for the 3D conversion. It also gave Edwards a great way to sell his plan for the revamped Japanese monster to Ken Watanabe. Watanabe has an ardent affection for Godzilla, repeatedly impersonating the monster and his signature roar throughout our interview (which you can hear above). His fascination with Edwards' movie began when the two of them sat down, and the director eagerly unfolded 20-minutes of pre-viz action sequences. To secure Watanabe, whose character plays a major role in Godzilla, Edwards showed him animated boards of several of the film's major monster attacks, including one that takes place on an elevated train line, one in an airport, some urban destruction, and a scene involving a massive monster making a snack of a nuclear submarine. Watanabe summed up his reaction to all this with one word: "Wow." Taylor-Johnson admitted to me he was at first reluctant to take on Godzilla, saying, "I guess there was an initial thought of, 'Hang on, what? They’re going to do another Godzilla? Why?'" What piqued his interest was director Gareth Edwards. As an admirer of Edwards' first feature Monsters, Taylor-Johnson agreed to take a meeting with him. There, Edwards not only shared his passion for the project, but also a teaser of how he wanted it to look. Taylor-Johnson recounted, "I watched that (teaser) and it was beautifully shot. It was interesting." This was the same teaser that played at Comic Con, and thrilled crowds. It sold Taylor-Johnson, who saw Godzilla wouldn't just be another monster movie, not with Edwards at the helm. He added that the Edwards' visual effects prowess was impressive, but that's not what won him over. "It was literally just being able to explain how he can shoot Godzilla on a big scale, but also do it from a really different perspective, the same way Monsters is really raw, from a person’s perspective. So, it was just a really gritty way of shooting a monster movie." In the film, Taylor-Johnson gets a lot of facet ime with the movie's MUTOs - also known as Massive Unidentified Terrestrial Organisms. In one particularly harrowing scene, his character Ford Brody is helpless on an elevated train as a MUTO takes out the rails ahead of it. I asked Taylor-Johnson how these scenes--where he has to look like he's interacting with a monster who will be added in post-production--come together on set. The simple answer is trusting in Gareth Edwards' direction and tapping into Taylor-Johnson's own imagination. There was no picture reference on set or motion-capture performer snarling his way. "Sometimes it would be like, 'Ok, now look up a bit higher, and then, ok, now he’s going to turn around and whip his tail,'" Taylor-Johnson recalled. For many of the physical cues, he depended on Edwards' calling out instruction. But to land the emotion, the star was ushered through Edwards' concept art and extensive pre-vis of sequences so he'd have a clear picture of what Ford would be responding to. "A month before rehearsals and stuff, you see the production office and you get shown around the art room," Taylor-Johnson explained, "Then they can go, 'You know, we’re talking about this scene the trestle bridge and the train tracks and that’s what this is. This is where we...' so you can get a sense of it--the locations--and then you see the artwork for the MUTO and you see the destruction. So, you’re like immersed in it enough, you’ve got enough knowledge. You’re never like, oh we don’t know. We’re going to make it up later. They have a sense way ahead of time before, so there’s a lot to work with." Ken Watanabe was only nine or ten years old when he first saw a Godzilla movie. The specific title escapes him now, but he remembered the Godzilla movies of his childhood mostly as "just monster fight the different creatures or something, just a monster movie, entertainment. "But as he grew up and rediscovered the movie series on VHS then DVD, he was astonished to realize how rich with subtext and metaphor these stories are. For Watanabe, Edwards' attention to the inherent politics in the Godzilla mythos was part of the allure of this project. References to Hiroshima, World War II, and scars left on Japan and the United States by both appear in Godzilla. Any doubt he had about another American Godzilla vanished once he and Edwards talked about the meaning of the monster. "Before I met Gareth, I just wondering (about the drawbacks of another remake), but he has vision and teaser on his Godzilla that completely symbolic of feeling of Godzilla. Then, OK, I can do it." 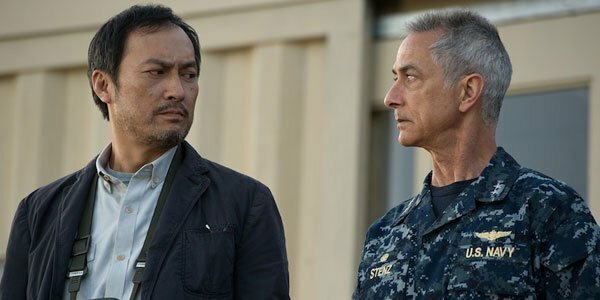 Considering Godzilla's origins as a Japanese creation, Ken Watanabe's character carries a great deal of dramatic weight as Godzilla's only Japanese lead. Adding to that is his name, Dr. Serizawa, a nod to (though not direct correlation to) the Godzilla franchises prior central scientist. In Godzilla, Dr. Ichiro Serizawa is the closest thing to a MUTO expert the world has, and that means he gets the film's best lines, including uttering the name of the titular MUTO. Watanabe laughed as he recounted shooting the scene where he says, "Let them fight," telling me how the DP has pulled him aside to confess this was his favorite line in the whole film. The actor admitted this spooked him a bit as they completed the setup, but his biggest point of pride came in the naming scene. With a broad smile he told me, "Producer and director wants me to call little more English pronunciation of 'Godzilla' for the audiences, but I don’t want to do that. I want to call 'Gojira.'" He pauses a moment, then fist pumps, and adds with a grin, "I won."